Trust in the object — gateway into the deep time history of matter and form — absorption into the flow of energy. Utopia and entropy — inscribing both into the landscape. Reconnect to primal forms and forces, rituals of dwelling and shaping, primitive feeling of being exposed and enveloped in the immensity of a landscape. Art without institutions, capital, possession/property; art in the commons, made of common materials; art of primordial shapes, activities, emotions, and forces. Ecology and art — can join up to resolve problems in the environment and the art world relatively quickly. Vision that most environmental problems can be solved by becoming aligned with Earth forces. Basic aesthetic units: mound of dirt, rock, words, branches, lines, holes, gouges, elementary shapes, bodily activities shared across species, bodily activities shared with Earth, wildness, vastness, desert sublime. Whole Earth, blue marble image — golden age of space exploration — deep emotional investment in just looking at Earth. Metaphor — carrying across — embedded in material practices embedded in Earth systems. 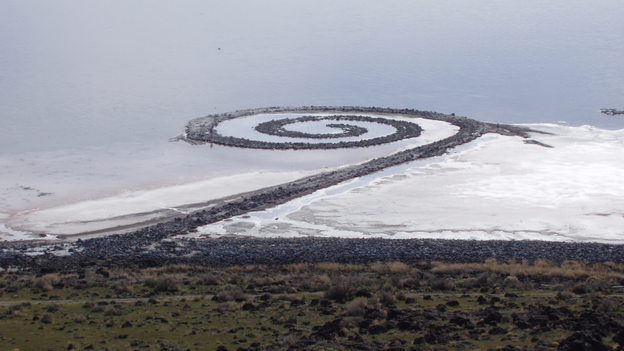 “Words and rocks contain a language that follows a syntax of splits and ruptures” — Robert Smithson. Learn, read, speak Earth-language. Device reduction/amplification — take a device, trope, form, gesture and amplify it or reduce it to negligible status in order to mimic Earth forms and geological processes. Poem as composition by field spacetime extending through the Georgic and pastoral pushed into the frontier, the wilderness, the starry skies, and the stretched-out, expansive horizon. Poem grounds itself on the Earth, and Earth juts through poem. We imagine we still live back on that old planet, that the disturbances we see around us are the old random and freakish kind. But they’re not. It’s a different place. A different planet. It needs a new name. Eaarth.” — Bill McKibben, Eaarth (2010). There is no easy emotional investment in any landscape — we are inscribing deeply ambivalent feelings into landscape at monumental scales. Deep emotional investment in just looking at the disturbed Eaarth. Ecological ideas part of feedback into ecosystem — ecosystems are affected by our thinking of ecology. Ecosystems make/unmake us as we make/unmake ecosystems. Humans have made the planet in the image of humans but also the human is dispersed, undone, newly fought over. We seek knowledge and responsibility for this Eaarth, but the changes to the planet also undo our means of knowing and being responsible. We seek to learn, read, and write with the planet, but the changes in the planet are remaking/dissolving the way we read and write. Restructuring/de-structuring of all our poetic devices occurring as we are using them. Eaarth as energy neoliberalism. How to produce, store, monetize, and dissipate energy for seven billion humans on a daily basis? Art can/will be embedded in Eaarth but will not be separated from human institutions, commodity forms, and messed-up environments — these are exactly what being embedded in the Eaarth entails. Eaarth art is: wave / rock / depleted fisheries / bleached coral / wave / rock / dreamboat run aground on concrete beaches. Indigenous and ecojustice critique of Earth Art’s utopian formalism and isolation of the primordial power of the elemental from settler colonialism, carbon-based power regimes, and the continual extraction of life, labor, and nature from the globally disenfranchised. Running fence — inseparable from border walls, gated communities, refugee camps, corporate campuses, protest barricades. Basic aesthetic units: trash sublime, everyday toxicity, bus stop ephemera, massive infrastructures, life-cycle of commodity forms, life-cycle of ice, your moody moods, plastic-oil industrial complex, zoning of everyday life, daily cycle of media platforms, ____animals, rush to fix planet and rush to watch it fall apart. Waning of trust of art’s materials — their redemptive qualities, aesthetic lures, participation in art making as demonstration of enriched life. We use toxic materials to make art that documents the gut-wrenching problems of toxic materials. Laying bare the device now means laying bare the sourcing of the device’s material, its deep history, transformation by industrial processes, imbrication with labor, up to its incorporation in a system of exchangeability and meaning, and following through to the afterlife of the device, rusting its heart out. Visual poem/sound poem/google poem/linguistic glitch/stuck keyboard poem: Eaaaaaaaarth. Poem as composition by field constituted by a monocultural, chemically saturated, corporatized grow-op. Poem as composition by brownfield. Device reduction/amplification to mimic distressed Earth, energy addictions, rambunctious media ecologies, planetary-scale problems. This is not about replacing ecopoetics, an enduring, shaken, but unfinished and unfinishable project worth forever fighting for. Still hitching a ride on ecopoetics, but ready for anything. How to respond to “peak everything”/ “this changes everything” in multiple ways with multiple forms and multiple questions. Establish this post-ecopoetics against USA declaration of itself as post-ecology and post-truth, as it dismantles the E.P.A., re-militarizes the nation, and fuel-injects manufacturing and consumerism in a bid to pit nationalism against the planetary. What kind of writing and reading can provide the basis for collective planetary way of life now? Will Alexander: “we’re on this planet, and we have to start to build an internal ark.” Use, for example, Rogue NASA as model. How many worlds do we have left? What kind of Earth do we want? It seems easier to address the great, wide off-worlds of the universe than it is to address a better future tomorrow. No matter how many versions of the end of the world we’re exposed to, amidst and within it all we still must continue to experiment on how to live, how to be together socially, politically, aesthetically. We must continue the tradition of experimenting with the sayable, knowable, and writeable with regard to past, present, and future Earths. This is post-ecopoetics. Joshua Schuster is an associate professor of English at Western University. His book The Ecology of Modernism: American Environments and Avant-Garde Poetics (U of Alabama P, 2015) won the Alanna Bondar Memorial Book Prize from the Association for Literature, Environment, and Culture in Canada. Recent essays have appeared in Humanimalia, minnesota review, and Photography & Culture, as well as in an edited volume Critical Perspectives on Veganism and in the book Edward Burtynsky: Essential Elements (Thames & Hudson, 2016). He is currently working on a book project What Is Extinction? A Cultural and Natural History of Last Animals.